Just a Fat Girl in Flip Flops: Illustration Friday - "Feet"
Great PIC!. Love the nail varnish! Love the bright bold colors! Yes! Yes! i knew there would be flip flops! Great illo. hey awesome!! 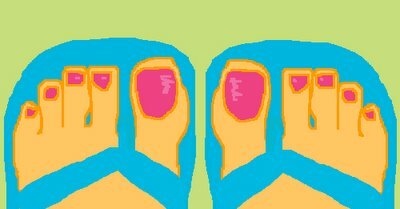 i drew flip flops too! arent they great...i couldnt live without them! lets see your real toes? I'll post on my blog. I want the same look, complete with cool blue flip-flops!